Since I created this graphic over 5 years ago, I’ve learned A LOT about how to talk about sexual harassment and violence, particularly with men. It’s summarized in this TEDx BeaconStreet talk. Or for some quick tips on talking about #MeToo on Twitter, try this blog post. If you want to break the ice on consent, healthy relationships or supporting your survivor friends, you’ll find more practical guidance at The Uncomfortable Conversation’s YouTube Channel. 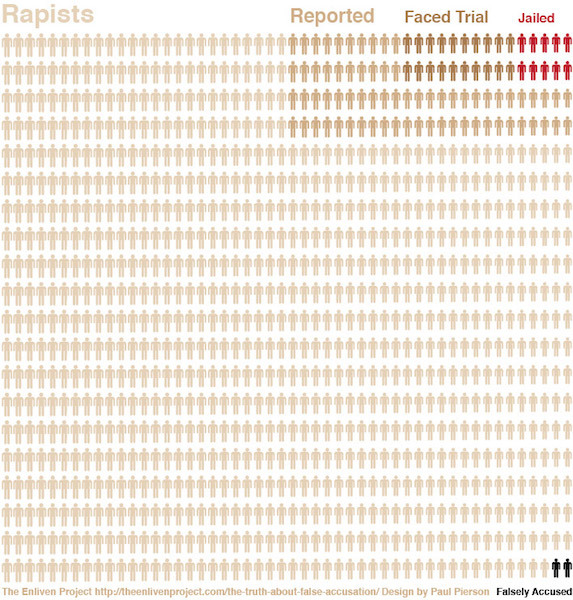 If you are looking for detail on The Truth About False Accusation, click on the graphic below or view as PDF here. Please note that many of the source links are now out of date. Looking for ways to make your conversations about sexual harassment and violence more productive? Over 100 conversations with leaders and experts on sexual violence to determine gaps in the field’s direct service work, capacity, and marketing and communications efforts. Over 100 conversations with potential allies from other fields and industries to better understand which messages on sexual violence are most compelling to share. A series of convo-graphics designed to move the conversation on sexual violence forward, in partnership with a design firm, reaching nearly 700,000 people. The Enliven Project was named a 2013 Echoing Green finalist, a competitive fellowship program for social entrepreneurs. The Enliven Project was one of 39 finalists selected from over 3,000 applications. Established a strong, inclusive, and practical voice on the topic of sexual violence with articles and op-eds placed in Good Men Project, Huffington Post, Providence Journal, CommonHealth (WBUR), and others.